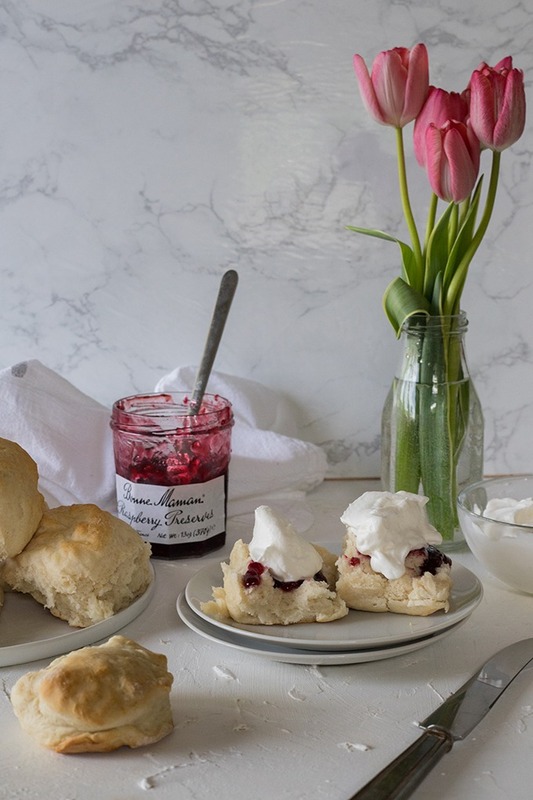 If you’ve never had a scone (a proper, British scone) you are in for a treat today! These are actually one of my favourite things to bake for afternoon tea, and bring back so many beautiful childhood memories! As you may have figured by now, Adam and I are both Australia. If not, then Hi – we’re from a different country! I love talking about Australian food because I feel like we have some amazing foods that come from all over the world, and it is probably the biggest thing I miss about being home. Australia doesn’t really have a typical cuisine as such, apart from maybe Vegemite on toast, but we do have a hugely multicultural society that brings in SO many damn good dishes from all around the world. Of course, having been colonised by the British back in the day, we also have a lot of foods that were traditionally from Britain. There are so many more to list! But one I need to mention (for obvious reasons) are scones. In particular scones, and also lemonade scones. Now for my American friends, I feel it’s time to differentiate between a British scone, an American scone, a British biscuit and an American biscuit – because it can get pretty confusing. 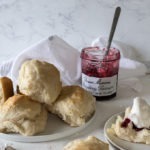 British Scone – light, fluffy, a little bit more savoury, usually served with raspberry jam and cream and served with a pot of tea. Same shape as an American biscuit but different. American scone – triangle shaped, usually glazed, a lot sweeter, can have extra add-ins, like chocolate or fruit. 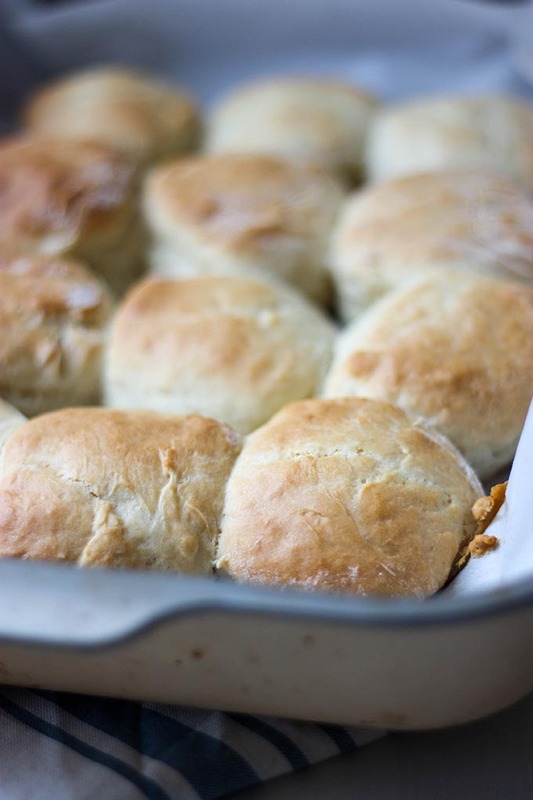 American biscuit – British scone shaped, denser like a damper, and savoury. Phew, we got there. I think that’s about as good of a comparison I get – it is very confusing sometimes! So long as you remember, if I’m talking about lemonade scones, I am 100% talking about the British kind. My family would have scones and jam and cream a lot when we were growing up. It was so exciting, sitting down at the table for a proper afternoon tea, munching on scones and sipping on hot, sweet tea! It was heaven. I’ll never forget watching Mum make them, perfectly cut them, brush them, then watch them rise in the oven, my mouth watering with anticipation of what was to come! These lemonade scones are really easy to make, and only require 3 simple ingredients – lemonade, cream and self-raising flour. It is essential that you use self-raising flour, because that is the rising agent, and lemonade/Sprite will make them light, fluffy and just a little bit sweet. They won’t work with any other soft drink! Having done a little research, it has come to my attention that American’s have a different perception of lemonade compared to Australians. Trust me on this one (I’ve done it twice), if you’re in America, Sprite will work just fine! The secret to making these super fluffy is not over kneading the dough. To make the dough come together, you want to ‘cut’ or mix the dough with a knife – this will help you avoid over kneading. The next secret is when to make sure your surface is floured well when you turn out the dough and don’t worry too much about kneading it out of the bowl, simply just turn it out, and lightly press it into a rectangular shape. I’ve mentioned this in the recipe notes, but just to confirm, the dough will be sticky! Don’t stress, if it’s too sticky to work with, just add a little more flour. You should be able to work it so that you can evenly, and cleanly cut rounds out of the dough. You’ll want the height of the dough to be about 4cm or about 1.5 inches – this will help them rise even further. The final secret with these is to not worry about using a fancy scone cutter – a simple wine glass, dipped in flour will work a treat! I use my stemless wine glasses and they make the perfect rounds! These easy lemonade scones contain only three ingredients and are so, so good! Light and fluffy, these are the perfect treat for afternoon entertaining! Generously flour a surface, and with floured hands, turn out the dough onto your floured surface. Shape into a rectangle, about 4cm/1.5 inches thick. Dip a wine glass in flour. Cut out rounds and place on a lined baking tray. Place in oven for 25-35 minutes until golden brown on top (note 7). Serve with whipped cream and fresh raspberry jam. Note 3 - I use just a small bottle of Sprite, in Australia, we get Schweppes lemonade, in the US Sprite, works a treat! Note 4 - the dough WILL be sticky, that is why I recommend having a generously floured surface and hands when you roll it out. If you find it is too sticky to work with, place the dough back into the bowl and add a little bit of extra flour until it is workable. The dough should be sticky, but not so sticky you can't actually work with it. Note 5 - My last scone is usually the 'hack job' scone I make roughly with my hands you know, the one you eat first before anybody sees it - it won't look pretty but you don't want to waste your dough! Note 6 - the milk will help them brown. You just want to lightly brush them, don't drown the poor things! Note 7 - the scones should be lightly browned on top, and light and fluffy in the middle. A good test is to knock the top, if it sounds a little hollow or makes a tap, it should be good! OK, I’m dying right now. Have people seriously asked if you ride a kangaroo to work? On a related note, I’m originally from Oregon and, no joke, people have asked me if we still use covered wagons! These scones sounds absolutely delicious! Perfect before a morning of riding that kangaroo! ha ha ha! oh wow, I didn’t realise people thing Oregon is still that backward! So far, the oddest form of transport I’ve seen here is two gigantic circus style bicycles and the unipiper on his unicycle playing the bagpipes! People have the funniest sterotypes of Australia though! it makes me laugh! You should totally give these scones a try! they are so good! These look so easy!!! I love that you use lemonade, I’m sure that adds an awesome flavor and tastes amazing with the raspberry jam. What a fun memory to have of afternoon tea! I hope my kids have nostalgic memories when they get over, that time is so special! Thansk Lindsay! I absolutely cherish the moment I spent with my Mum cooking! I can still remember when she used to prop my up on the counter when I was about 3 or 4 years old and show me what to cook! Fast forward 20 something years and we still share so many memories cooking! it’s the one thing I miss about not being home! These are the scones I’m used to eating! (My dad is from the UK). All of the scones you buy in America are so overly sweet, they’re more like dessert than breakfast. These look super tasty; I’ll have to give them a try baking them for my dad! OMG – do you ride a kangaroo to work!? Hahaha I died laughing reading that. I have visited Australia and absolutely love it there. I wish I had an excuse to move there! 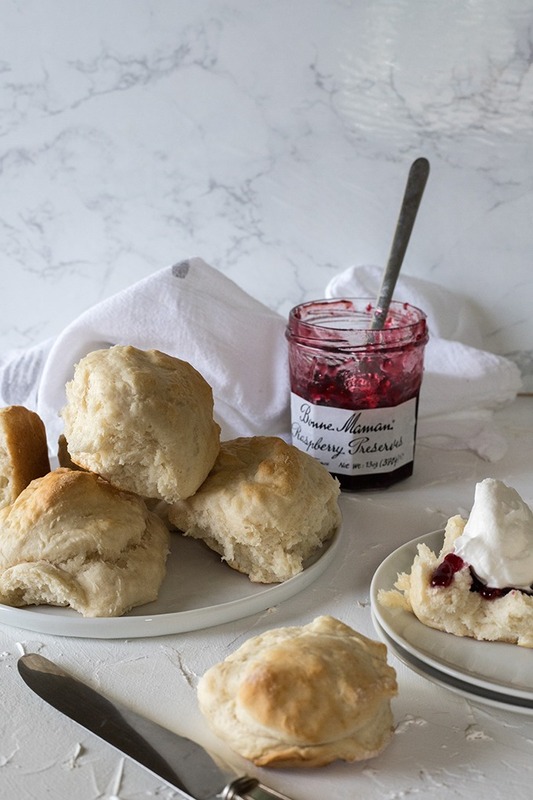 I was just thinking of making scones for breakfast tomorrow morning, and am loving this recipe. Luckily I have some lemonade sitting around….can’t wait to try this one! These scones are so toothsome, Georgie! Cannot wait to try this fluffy dessert! OK, in America, lemonade is basically water, sugar and lemon juice. It sounds like what you want for this recipe is a carbonated drink, because Sprite is a lemon-flavored carbonated beverage, also known as soda or soda pop. It’s fizzy. American lemonade is not usually fizzy. So it sounds like any lemon-flavored soda pop will work. Is that right? Thanks for the clarification, there are a lot of differences between beverages in Australia compared to America. But yes, carbonated works best as it makes the scones light and fluffy. I am actually not familiar with any other carbonated lemon-flavoured sodas in America, that’s why I went for Sprite because I knew it would be popular and knew everyone would know what I meant. I have only tried making them with Sprite and it works every time. I know the recipe won’t work with anything like 7up or Solo. But i’d be interested to try it with soda water as well. It’s important to realize that in the US, lemonade is what Australians and Brits call lemon squash (if life brings you lemons, make lemonade, etc). What you’re talking about is lemon soda in the US ie. Sprite. I love all scones regardless of where they come from, but I must say that I do prefer British style scones! And these lemonade scones look so delicious!! You are right they are light and fluffy, just as they should be! thanks Elaine! i prefer the British/Australian type too! although I had this most amazing chocolate chip with salted coffee glazed scone here the other day it was dreamy! I’ve made lemonade cookies before but never scones. The scones look fabulous, so light and fluffy! Lemonade in scones is so delicious! By lemonade in the states though I mean ‘Sprite’ just to clarify! it was so confusing when we first got here!!! there were so many different things I had to figure out! I love how easy these are with simple ingredients!! They look delicious! thanks Mindy, can’t argue with only 3 ingredients! Mind is blown that people in Australia don’t ride kangaroos to work! ? Sometimes I really wonder about people. I have to try these scones! As crazy as it sounds, I have this jalapeno-raspberry jam that I think would be perfect with these scones. ha ha people ask some interesting questions! jalapeno raspberry jam would definitely be interesting! Hi! I have been saving all kinds of scones recipes on Pinterest because I’m hoping to have a tea party this spring. I’ve never made scones and this looks easy as well as tasty! I was wondering if it would be ok to add some lemon or orange zest to these? Thank you for sharing your recipe!? I hope to hear from you soon! ?Have a good day! ?